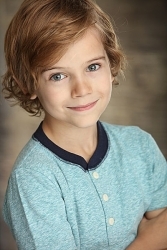 Adorable and Talented Child Actor Gavin Warren All Set for His New Role in "The Descendant"
Katy, TX, January 25, 2019 --(PR.com)-- Up and coming child actor Gavin Warren who was seen in 2018’s big hit, First Man (2018) is rearing to take on the lead role in his new movie, The Descendant. The Descendant is a horror flick that is scheduled to release in 2019. It is Warren’s first project as the main lead after having done an array of acting and modeling jobs on TV. Warren emerged as breakout star in First Man (2018) where he played the role of Neil Armstrong’s son alongside the likes of Ryan Gosling and Claire Foy. The film was led by the award-winning director of La La Land, Damien Chazelle and made $99.9 million at the Box Office. Even though Warren had done taken on small acting and modeling projects prior to winning a part on First Man (2018), he was asked to audition for the role. “I was told that the film was being directed by the Damien Chazelle of La La Land and I was eager to get the part after that. I made the audition tape myself in our playroom and I felt pretty confident I was going to get a call. I was called into audition eventually and two months later they called saying I had gotten the part,” says Gavin Warren. Warren’s talent in the movie won him the attention of other casting agents and directors and it wasn’t long until he secured a main part in his next movie named The Descendant. The Descendant is a horror flick in which Warren’s playing the lead character. The project is much darker than Warren’s previous work and touches on heavier topics that he will be tackling for the first time. “I like dark and scary movies, it’s definitely different to what I have done in the past but I like the challenge. I think it’s a little funny because they say some stuff. Literally one of the first lines is a bad word. It’s really funny,” says Warren about his upcoming project. Before doing movies, Warren was modeling for couture houses in Houston including Evolution Kids, Mint Couture and Kiss My Couture. His very first modeling gig was at Great Day Houston, a morning show at a local TV channel. He has also acted for TV commercials for Space Center and Reliant Energy. Houston-born Gavin Warren is a talented child actor who debuted in First Man (2018) under the direction of Oscar Winning filmmaker of La La Land, Damien Chazelle and starred alongside Ryan Gosling and Claire Foy. Warren is now preparing to play the lead character in The Descendant. Warren has also modeled for couture houses in Houston and acted in TV commercials.